The pulmonary artery is a blood vessel that connects the heart to the lungs. The pulmonary artery carries blood that does not have much oxygen. 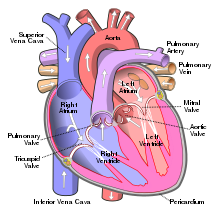 The blood from throughout the body is taken into the heart by the right atrium into the right ventricle. The blood is pumped into the pulmonary artery and into the lung capillaries. When the blood passes through the capillaries slowly to absorb the oxygen from the lungs. The oxygenated blood is taken through the pulmonary vein back into the heart through the left atrium and the left ventricle. It is then pumped throughout the body. This page was last changed on 19 June 2013, at 13:02.